Make a dynamic exhibit with optimal viewing areas! This 48 inch Metal Framed Extra Vision Showcase will draw attention to your finest merchandise. Two rows of adjustable 3/16" thick split glass shelves allow you to customize this glass display to fit your products in the best way possible. 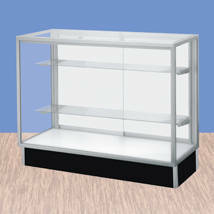 Availability in three widths - 48", 60", and 70" this style of enclosed display cases add to their versatility. Tempered glass top, front and sides and anodized aluminum frame extrusion makes this display cabinet one that will last. Add the optional LED lights and install to really light of the situation. 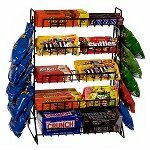 Order enclosed retail store display case today!